Suiting doesn’t need to be serious. Once you have your work/wedding/funeral basics (one dark grey, one solid blue) down, there’s plenty of room for self-expression and experimentation. Perhaps you want to channel your inner Johnny Thunders by rocking a rakish iridescent sharkskin suit with some wicked creepers. Maybe your idea of fun is dressing up like an English Lord and pairing a handmade tweed suit with some thick brogues and going for a relaxing stroll through the forest. No matter where your internal sartorial compass points you, there are plenty of cool suiting options that are anything but stuffy. 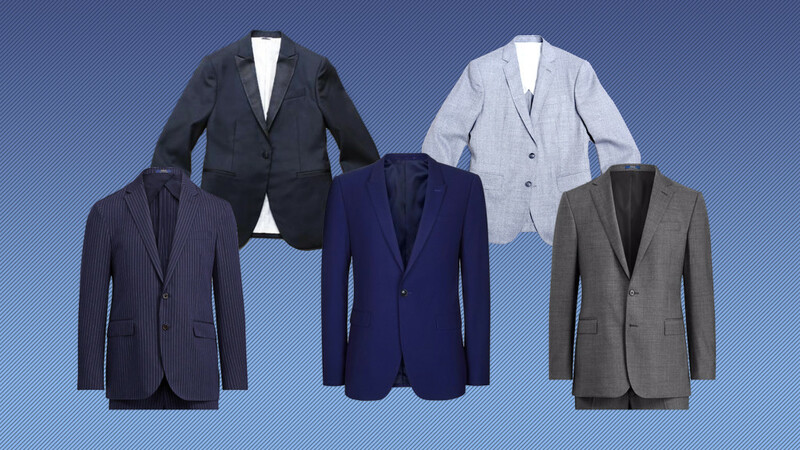 When shopping for a suit, there are just two things to keep in mind. The most important, and we can’t stress this enough, is the off-the-rack fit. You want your suit to be slim, but never tight. Even if you tend to rock your jeans and T-shirts a little on the young side, a suit will always benefit from a little breathing room, especially in the chest, crotch and calves. If you try on a suit and feel it pulling, or constricting, size up. The other important factor is post-purchase tailoring. Almost every suit will require a few tweaks at the tailor, so definitely budget at least $100 or so for shortening a sleeve, hemming a pant, etc. Aside from that, it’s time to fix up and look sharp! A classic navy suit will always be a good choice for work, but if you want to turn up the volume for your extracurricular activities, you should seek out funkier shades of blue. For a bold, 80s-inspired vibe, you can always go with a super-bright Yves Klein type of blue. And for a more polished look, a blue/black hybrid, better known as Midnight Blue, is perfect for weddings and other fancy occasions. The days of grey suits being synonymous with bland anonymity are over, young man. And while a classic dark grey suit should always have a place in your wardrobe (lest you need to attend a funeral or spearhead a corporate retreat) we highly recommend exploring lighter, more optimistic varietals, like this handsome joint from Brooklyn Tailors. Another pro tip: Look for the fabric to have a subtle pattern, which will add another cool layer of discrete visual interest. If you dig rakish suiting on the flashier tip, we highly recommending investing in a dope sharkskin suit. Back in the day, every working entertainer would have at least one sharkskin suit in their rotation. Stars loved sharkskin because its slightly iridescent sheen looks awesome under stage lights, but yours will look just as cool at a chic bistro or cocktail bar. Pair yours with a crisp white point-collar shirt and black shoes to really nail the look. A pinstripe suit is much more versatile than you would think. Paired with a bold spread-collar dress shirt and a wide tie, it becomes a deal-closing power suit that would make Gordon Gekko proud. But, when styled on the neo-preppy tip with a handsomely worn-in Oxford cloth button-down and some sturdy loafers, a pinstripe suit can also be made casually cool. The best part? If you find one in a medium to heavy fabric, you can get double the wear by rocking the jacket and pants separately. Let’s say you get invited to some fancy-pants black tie event and don’t want to spend good money on something you will only wear a few times—or worse, suffer the indignities that go along with renting a wack tux. There’s an easy solution to this problem. Go minimal with a monochrome tux. Not only will you look like a star the day of your big event, with some considered styling, you can also take a cue from Ralph Lauren and rock yours with some light blue jeans and a pair of killer black leather boots once the party’s over. That’s rich.